You can’t tell in the picture, but we had all just wiped away happy tears and those smiles continued long after we were done posing for the camera. 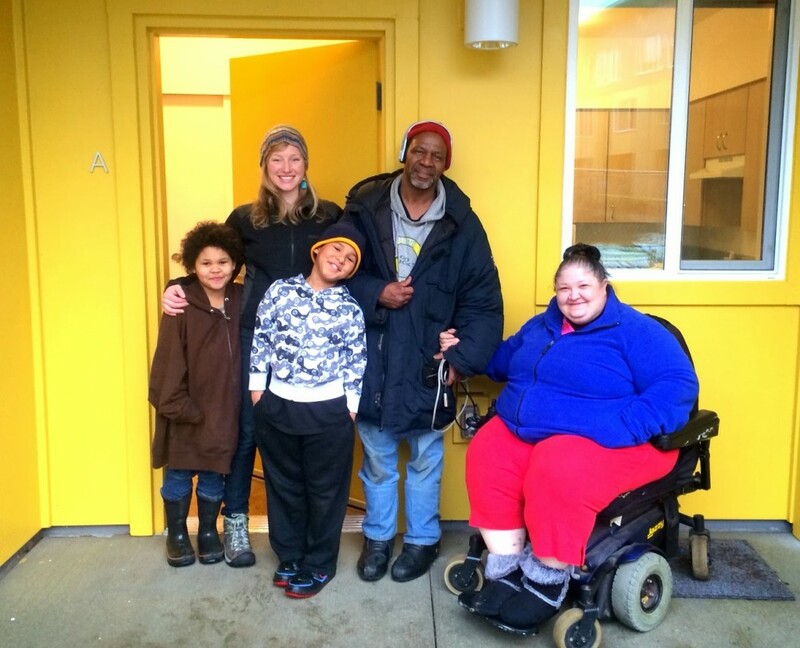 Last week, the Edwards family got the keys to their brand new, ADA-accessible three bedroom unit at Home Forward’s Stephen’s Creek Crossing property. We filled out the application on a whim several months ago, not banking a whole lot of hope that they would actually be chosen. I can’t emphasize how huge this is for a family that has subsisted on social security disability and sporadic income from short-term jobs. When I met them in the winter of 2011, they were sleeping in their car. With our support and their own income, they moved into an older, non-accessible 2 bedroom in a high-crime, but affordable part of Gresham. It was better than being homeless, we all agreed. So now they are set. Literally. They have a subsidized unit for as long as they want to stay, in a safe neighborhood, with many on-site amenities and a great school district. The kids have their own rooms and Linda can do things like use the kitchen sink and an enabled-shower which she’s never had access to before. We were all teary-eyed as we toured the place for the first time and Richard and Linda shared a long hug, full of relief at finally having made it. Here’s the thing though: attaining this kind of housing stability should not be that rare. As a housing caseworker for the past 3.5 years you’d think that I get to see this type of success more often. Unfortunately, because of the massive shortage of subsidized or even affordable housing that that is not the case. In contrast, I also work with a single mom, Sandy, whom JOIN helped off the streets and into a modest, two bedroom apartment in Gresham for her and her two young boys. Rent is $750, utilities another $200, and though she receives about $400 a month in TANF (Temporary Assistance for Needy Families), plus food stamps and child care support, every month is challenge. Sandy is one of the hardest working people I’ve met, and has submitted more applications, worked more night jobs, and taken the bus at 4am to be at work more rainy mornings than anyone should. In several months of trying, she still hasn’t been able to secure a job that will cover her family’s expenses and continually requires occasionally rental assistance from JOIN or a family member. She and her boys are living in a constant state of stress, unsure whether they’ll be able to make rent next month. With no disposable income and few outside resources, life after homelessness continues to be a struggle. Sandy put herself on waitlists for site-based Section 8 in 2010 and started out at number 320. She is now number 92- meaning that it could still potentially be years before her name comes up. To write this, I wanted to find out what th e current waitlist was for the Stephens Creek Property and reached a recorded message informing me that ALL waitlists to ALL public housing units are closed due to over capacity. This isn’t a surprising fact, unfortunately. It was big news when the waitlist for a Section 8 voucher lottery opened for ten days in 2012, for the first time since 2006. Tens of thousands of Oregonians who struggle to pay rent have their name optimistically on these waitlists, though they are well aware of their slim odds at being chosen. Many lists have estimated wait times of 10+ years, though a few do have better estimates, like 2 years. All of these units are subsidized, allowing residents to pay 30% of their income, whether they are on social security, zero-income, or working a low wage job. The other 70% of market value rent is supplemented by federal grants, funded by the department of Housing and Urban Development and managed locally. I don’t know what the answer is. The system worked for the Edwards family, but not for Sandy and her family. Affordable housing is an idealistic and often unattainable goal for many, and the growing income disparity in the US continues to marginalize a large portion of the population. I cannot emphasize how thrilled I am for the Edwards family getting into one of the beautiful units at Stephens Creek Crossing. But like Sandy and her family, I am still well aware of the millions of homeless and unstably housed Americans that our current system isn’t serving.